Astrophytum is a very popular genus in spite of having only a few species. Astrophytum myriostigma is widely distributed across in northern and central Mexico mainly in the Chihauhaun desert. It is an extremely variable species and may varieries have been described. 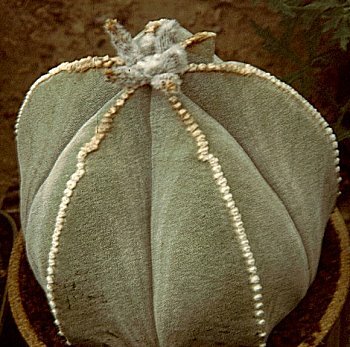 This fine specimen of the Bishops hat cactus was photographed in the Cactus Data Plants Nursery in California. It loves a sunny position and will slowly grown into a very attractive plant because of its form and the fine white flecking on the epidermis. It will flower right through the summer producing two inch diameter glossy yellow flowers. It prefers a well drained mineral compost and perhaps less water than the average cactus and a bright sunny position. It hybridises freely with the other species of Astrophytum producing a wide range of attractive forms.